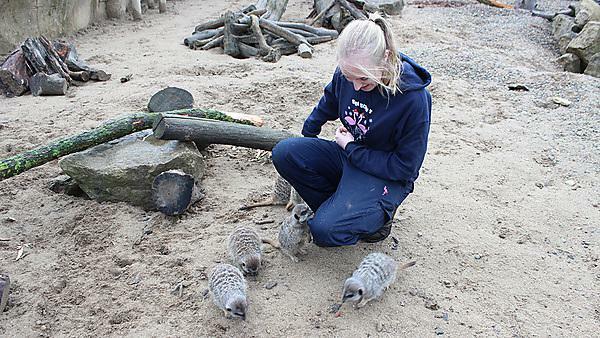 Since graduating in 2014, Rebecca Whitelegg has gone on to work as a Zookeeper at Flamingo Land Zoo in North Yorkshire. I’ve been building up my experience by working in several zoos, such as Twycross Zoo, and taking part in an internship in America. I now have my first ever full-time, permanent role as a zookeeper at Flamingo Land Resort in Yorkshire and I am absolutely loving it! Probably going to live in America for three months whilst volunteering at a big cat sanctuary. Going so far away on my own was definitely a challenge, but it made me a lot more resilient and I now feel that I can face any challenge that may arise in my career. I would have stayed in America for longer. The internships offered were on a three month rolling plan and I chose to only do the first tier. I would have loved to have stayed and built up my knowledge even further to enable me to work effectively with rescued animals or animals from a poor background. I’m sure everyone says this, but just study more! Go to as many lectures as possible, read up on the lectures beforehand, and take thorough notes. At the same time though, enjoy yourself! University is the only time in your life you will have your friends around you pretty much 24/7, so make the most of them being there. My main reason was the proximity to a number of zoos, such as Dartmoor Zoo. The first two years of the course were spent at the campus next door to Newquay Zoo, and so offered work placements. Without those placements I don’t think I would have been able to get my first job at Twycross Zoo. It helped me to decide what section of animals I would like to work with in the future. My placement at Newquay Zoo was with carnivores and it was an instant hit. Probably all the campus markets that were held – my friends and I loved browsing them. It helped me to realise that you really have to work hard for what you want; nothing just comes to you. If you want something, you have to go and get it! The library was a huge help as it was so easy to find citations for papers; the campus and the lecturers, who have a wealth of knowledge, were amazing, and the city itself is a great place to live as a student!